Utrecht’s city hall dates back to at least the 16th Century. About ten medieval buildings and city castles were interconnected as the requirements of the city grew, so that the building is a labyrinth with many different floor levels. In 1997 the local government commissioned Spanish architect Enric Miralles to design a building that was open, transparent and inviting. The aim was to combine the existing monumental parts, which were to be renovated, with a new wing.From 1995 an energy saving campaign in municipal buildings was started. Type of building: Administrative; many styles and construction materials. Aim To show how a historical building can be addressed to improve its overall sustainability in the built environment. In particular to identify the issues relating to improved energy performance in such a difficult building, and the role of public information. Key points The city hall is one of very few publicly owned buildings in Utrecht where the Display™ project is feasible. The energy label is shown in the entrance to the hall as just one of many initiatives to raise awareness of the need to save energy and contribute in other ways to environmental sustainability. The municipal office uses awareness material, including information on green procurement in offices, that they have developed themselves to promote the development of environmental and sustainability awareness and good practice. (see pictures below)One of the major discussion points is how the Display™ label can be used when the Government has yet to develop the required energy performance certificate methodology under the Energy Performance of Buildings Directive. The current methodology is complex, and for a complicated building such as the City Hall, there are many questions on the validity of any method. 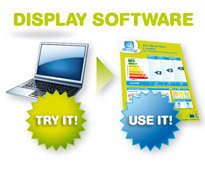 The Display™ process has the advantage of simplicity and it will be interesting to compare it with the final requirements of the national standard. More importantly though, in the context of the on-going campaign to save energy in this and other buildings, the Display™ label is being used to monitor energy and water use on an annual basis and to report on them using a consistent method.The renovation of the building was a result of an architectural competition, and the winning architect created a new wing as well as removing some of the old features and placing them in more appropriate positions in the complex. As the building already participated in the energy saving campaign the energy consumption has been monitored throughout nine years. Due to the new wing, the energy consumption has been increased. However, in the last years the energy consumption decreased, due to ’good housekeeping’ measurements. The renovation of the building included a few measurements to reduce the energy consumption. A new heating and cooling system was installed, the new wing was built following national obligated standards for energy performance and motion detectors were installed in the toilets to control lighting. However, a large part of the building is a historical monument. Dutch legislation about monuments made it impossible to improve the insulation of windows or roof. Besides this the architect had specific demands about refurbishment of the building. There are many large windows and open spaces in the building and the lighting in the building was designed by the architect. Energy efficiency was not part of the original specification and of course his selection of lights don’t save a lot of energy. In the years immediately following the refurbishment the heating and cooling system didn’t perform very well. By continuing to improve the operation of the system in 2004 the energy consumption finally reduced. Added to ’good housekeeping’, for example switching lights off after opening hours, reduced the energy consumption even further. Financial support to fund these measurements wasn’t necessary, but the perseverance of the building manager was essential and co-operation of the building users even more. Benefits The measurements save approximately 60 000 kWh a year. With the present energy prices, this is a cost reduction of approximately € 12 000 a year. The avoided CO2 emissions is 4 kg/m2 a year. This seems low, however for a building with a surface area of 9040 m2 this means a emission reduction of 36 000 kg a year.More importantly the complaints about the heating and cooling system stopped, which means the response to the awareness campaign and the DisplayTM poster is more positive. However, it is necessary to find a way to keep the attention of the public for the subject. Otherwise the attention and change in behaviour will fade away. Thus, there is still more work to do in the years to come. Partnership details The building manager and keeper are the most important partners in this shining example. The complaints about the heating and cooling system made it necessary to intervene. Therefore the building manager and keeper received the assignment to reduce the energy costs, due to a cut-down in expenses. This also meant it was not allowed to invest in additional energy saving measurements. Thus, improving the heating and cooling system and good housekeeping were the best options.A number of energy awareness events were held, and posters, both Display and others from the municipal office in the main entrance hall. Achievements For nine years the energy and water consumption in the building have been monitored and evaluated. Every month the building manager receives an overview of the energy consumption. If possible preventative actions are taken in the case of extremely high energy consumption. In recent years the success of the energy saving campaign has subsided, and it becomes more difficult to maintain the standard set in 2004. Financial means to invest in energy savings are limited. Every time a short term view about the financial investments seem to be the biggest obstacle. Engaging building managers and keepers seems to be the key for success. With the improvements of digital metering it might be possible to get some financial means to invest in measurements. Adding these small actions and the obligation of a energy label, should create new success for the energy saving campaign. Lessons Learned Although the city hall of Utrecht is not near the A-class of the DisplayTM label, it is an example which should encourage other municipalities. It shows that even in a monumental building with large open spaces improvements are possible. Good housekeeping can reduce the energy costs and move a building toward class A. Good housekeeping should start every energy saving campaign as it is the easiest and quickest way to get results.See pictures of label in 2003 and 2004.